Chicago youth 4 to 24 – their families and their teachers as well – will be treated to a full day of playful learning opportunities on Saturday, January 24, at the 2nd Annual Destination: Chicago – Winter Break. Sponsored by Chicago City of Learning in cooperation with Hive Chicago Learning Network, the event will be held at Jones College Prep, 700 S. State St., between 11am and 4pm. More than 20 organizations will be on hand to introduce young people to the plethora of citywide and online programs in arts, technology, science and more that can open new pathways for their time and minds. Those attending can: program robots and experiment with 3D modeling with Best Buy’s Geek Squad Academy; compose choreography with Hubbard Street Dance; build a skyscraper with Chicago Architecture Foundation; get creative with clothing in the School of the Art Institute of Chicago’s Fashion Wars; design an emoji with Chicago Botanic Garden; become a finger printing sleuth with Project Exploration; explore engineering with Argonne National Laboratory; create stroboscopic digital images with YOUMedia; build a UV light with Scientists for Tomorrow; experience Hip-Hop Yoga led by Mindful Practices; make upcycled bird feeders with The Chicago Academy of Sciences and its Peggy Notebaert Nature Museum; use html coding to create webpages with Adler Planetarium; investigate hydroponics with Sweet Water Foundation; mix music with Best Buy Teen Tech Center Little Black Pearl Workshop; and much more. 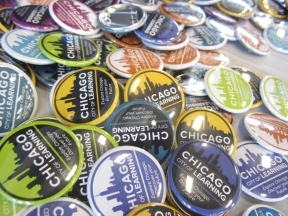 For more information on Chicago City of Learning and Destination: Chicago, visit http://ChicagoCityofLearning.org.